Radio-telescope images have revealed previously-unseen galactic cannibalism -- a triggering event that leads to feeding frenzies by gigantic black holes at the cores of galaxies. Astronomers have long suspected that the extra-bright cores of spiral galaxies called Seyfert galaxies are powered by supermassive black holes consuming material. However, they could not see how the material is started on its journey toward the black hole. 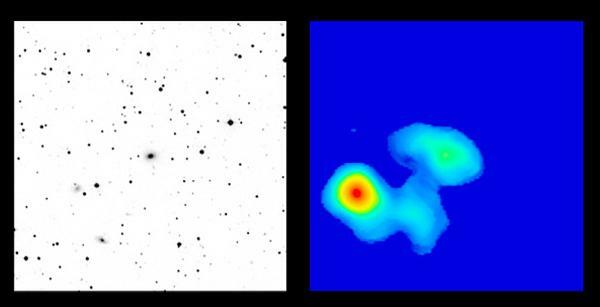 Radio image shows gas streaming between galaxies. One leading theory said that Seyfert galaxies have been disturbed by close encounters with neighboring galaxies, thus stirring up their gas and bringing more of it within the gravitational reach of the black hole. However, when astronomers looked at Seyferts with visible-light telescopes, only a small fraction showed any evidence of such an encounter. Now, new images of hydrogen gas in Seyferts made using the National Science Foundation's Very Large Array (VLA) radio telescope show the majority of them are, in fact, disturbed by ongoing encounters with neighbor galaxies. "The VLA lifted the veil on what's really happening with these galaxies," said Cheng-Yu Kuo, a graduate student at the University of Virginia. "Looking at the gas in these galaxies clearly showed that they are snacking on their neighbors. This is a dramatic contrast with their appearance in visible starlight," he added. The effect of the galactic encounters is to send gas and dust toward the black hole and produce energy as the material ultimately is consumed. Black holes, concentrations of matter so dense that not even light can escape their gravitational pull, reside at the cores of many galaxies. Depending on how rapidly the black hole is eating, the galaxy can show a wide range of energetic activity. Seyfert galaxies have the mildest version of this activity, while quasars and blazars are hundreds of times more powerful. The astronomers picked a number of relatively nearby Seyfert galaxies that had previously been observed with visible-light telescopes. They then carefully studied the Seyferts with the VLA, specifically looking for radio waves emitted by hydrogen atoms. The VLA images showed the vast majority of the Seyferts were disturbed by encounters with neighbor galaxies. By comparison, similar VLA images of inactive galaxies showed that very few were disturbed. "This comparison clearly shows a connection between close galactic encounters and the black-hole-powered activity in the cores," said Ya-Wen Tang, who began this work at the Institute of Astronomy & Astrophysics, Academia Sinica (ASIAA), in Taiwan and now is a graduate student at the National Taiwan University. "This is the best evidence yet for the fueling of Seyfert galaxies. Other mechanisms have been proposed, but they have shown little if any difference between Seyferts and inactive galaxies," Tang added. "Our results show that images of the hydrogen gas are a powerful tool for revealing otherwise-invisible gravitational interactions among galaxies," said Jeremy Lim, also of ASIAA. "This is a welcome advance in our understanding of these objects, made possible by the best and most extensive survey ever made of hydrogen in Seyferts," Lim said. Kuo, Tang and Lim worked with Paul Ho, of ASIAA and the Harvard-Smithsonian Center for Astrophysics. The scientists reported their findings in the Astrophysical Journal.